Multi-faceted Nicole Oliver continues to keep extremely busy with roles on screen as an actor and in the voice-over market. This spring Nicole divides her time with roles on Hallmark (Eone) “Radio Hype,” Lifetime’s “Ungodly Acts” and the feature film “Marrying the Family.” As one of the most respected voice-over actors Nicole continues to be in demand in Animation on Season 5 of “My Little Pony” now airing on Discovery Family and “Kate and Mim Mim” airing on the Disney Channel. Hallmark’s “Radio Hype” is directed by Kris Tabori and is starring Alison Sweeney. Nicole has the role as Julie, the owner of a fashion boutique and sister to Nick (Jonathan Scarfe – Hell on Wheels). Carl Bessai directs Lifetime’s “Ungodly Acts”. Nicole plays Paula Martin one of the leaders of the Church of the Blessed Light Ministry. “Marrying the Family” unites Nicole with many of the ensemble cast from the Film Festival darling (VIFF 2013; TIFF Next Wave 2014) “Leap for Your Life”. “Marrying the Family” follows Dylan (Taylor Hill), as she is getting ready for her wedding to her high school sweetheart Corey (Adam Di Marco). However, any plans for a simple wedding are put on hold when her wedding planner mother Kathy, played by Nicole, steps in to design a wedding Dylan will never forget. Marrying the Family is a sweet comedy about love, family, growing up and letting go and is directed by Peter Benson (What An Idiot). Nicole Oliver has been nominated for several Leo Awards for her work on both the small and big screen. She is the recipient of the UBCP/ACTRA award for Best Voice for her work in animation. She has guest starred on numerous television series “Supernatural and “Rogue”. She has also starred in many MOW’s including “The Christmas Ornament” starring Cameron Mathison and Kellie Martin, “The Woodcarver” with John Ratzenberger; “Taken Back – Finding Haley” with Amanda Tapping and “Innocent” with Bill Pullman and Marcia Gay Harden. For four seasons, Nicole was also the host on the hit Slice Network series “Crash Test Mommy”. A high light for Nicole was acting along side her young son, William Ainscough, who starred as Billy in City TV’s “Seed” for two seasons. Well known throughout the world at Brony and Fan Conventions as Princess Celestia and Cheerilee on “My Little Pony: Friendship is Magic” and Zoe on the cartoon “Littlest Pet Shop”, her voice-over work continues to thrive. In animation, she has popular roles on “Max Steel”, “Martha Speaks”, “Strawberry Shortcake”, and “Superbook”. She is currently the voice for Wireless Wave, and has provided her voice to over 100 companies including American Express, Starbucks, Salon Selectives, Club House, and IKEA. 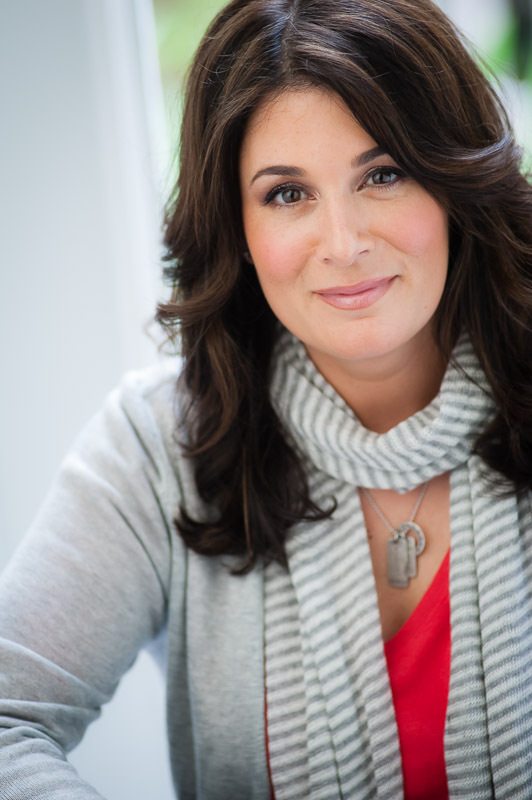 Nicole Oliver has worked for over twenty years in the entertainment industry as an actor, producer, and director. This multi-talented, incredibly busy mother and professional has mastered the balance between family and work, and has furthered her education with a Masters of Arts in Communication from Royal Roads University (2011). She is the recipient of both the Founders Award for leadership and sustainability and the Chancellors Award for highest academic achievement. Nicole believes that diversification is the key to success, and that with success in life there can be balance. She resides in Vancouver with her husband and their two sons. Nicole is available for interviews and photographs upon request. This entry was posted in Nicole Oliver and tagged 2 Broke Girls, 2014, ABC, accomplishments, acting, actor, actress, Adam Korson, Alexander Skarsgard, Andrea Riseborough, auditions, baseball, Battleship, blog, blogger, Canada, CBS, Chris Ainscough, City TV, comedy, commercial, composer, Disney Channel, drummer, editor, entertainment, film, filming, Halifax, Lesley Diana, Minecraft, network, Never Let Me Go, Nicole Oliver, Nova Scotia, Oblivion, Once Upon A Time, online, PR, press, Public Relations, publicist, resume, Seed, series, soccer, The CW, The Duffer Brothers, The Promotion People, theatres, True Blood, TV, U.S., United States, Vancouver, William Aisncough on May 12, 2015 by press. The Joey Awards have been established to recognize young performers in Canada through awards, and educate their parents on keeping their young performers safe in the crazy world of Showbiz.” The Joey Awards goal is to reward young actors and actresses in Canada for their hard work and dedication to their craft. William has received other award nominations for ‘Seed’ including a 2014 Leo Award nomination for best performance in a Comedy, Variety or Musical www.leoawards.com and his 2013 Actor nomination for the ‘BEST NEWCOMER’ category for the UBCP/ACTRA Awards (www.ubcp.com). ‘Seed’ stars a talented ensemble cast headed by Adam Korson (2 Broke Girls). It was clear after booking his first two auditions that acting for William was a path well chosen. William’s very first attempt at acting was a success, when he landed his first audition in an open casting call for the feature film Hidden’. William was successful in landing the role of Joey, a slightly shy and soulful boy and close friend and neighbor of Zoe’s (Emily Alyn Lind). The feature film, which follows a family hiding in a bomb shelter after a mysterious outbreak devastates civilization, stars Alexander Skarsgard (True Blood, Battleship) and Andrea Riseborough (Oblivion, Never Let Me Go). The film Hidden, directed by The Duffer Brothers is slated for theatrical release. William has a supporting role as Zach in ‘The Christmas Secret’, a Hallmark Movies & Mysteries Original World Premiere on Sunday, December 7, 9/8c starring Bethany Joy Lenz and John Reardon. http://www.hallmarkmoviesandmysteries.com/the-most-wonderful-movies-of-christmas/most-wonderful-movies William will also be seen in his Guest Star role as Melvin in ‘The Haunting Hour’ episode entitled Spores set to air on the new Discovery Family in November 2014. Other recent highlights for William include playing the iconic role of John Darling in ABC’s ‘Once Upon a Time,’ and a major supporting role in ‘Zapped’ the television feature for the new Disney Channel starring the US pop music sensation and actor Zendaya. Following in his parent’s footsteps (Nicole Oliver, actress; Chris Ainscough, composer/film editor), William Ainscough is making a serious impression in the entertainment industry. It was after watching his mother in action during visits to the sets of some of her film projects that William’s interest in the acting world began. Nicole inspired him to try acting for himself and began taking classes. William has had the chance to act opposite his mother in several episodes of ‘Seed’, when she plays Billy’s teacher and principal, Mrs. Anderson. Aside from acting, William is an accomplished drummer, loves soccer and baseball, and is a huge fan of the online game Minecraft. This entry was posted in William Ainscough and tagged 2 Broke Girls, 2014, ABC, accomplishments, acting, actor, actress, Adam Korson, Alexander Skarsgard, Andrea Riseborough, auditions, baseball, Battleship, blog, blogger, Canada, CBS, Chris Ainscough, City TV, comedy, commercial, composer, Disney Channel, drummer, editor, entertainment, film, filming, Halifax, Lesley Diana, Minecraft, network, Never Let Me Go, Nicole Oliver, Nova Scotia, Oblivion, Once Upon A Time, online, PR, press, Public Relations, publicist, resume, Seed, series, soccer, The CW, The Duffer Brothers, The Promotion People, theatres, True Blood, TV, U.S., United States, Vancouver, William Aisncough on November 3, 2014 by press. In the past year, William Ainscough has been recognized for his hard work on “SEED”; being nominated for the 2013 UBCP Best Newcomer and most recently for a 2014 Leo Award Best Performance in a Music, Comedy, or Variety Program or Series category. William was also thrilled to attend the CSAs in Toronto in March to celebrate Seed’s 8 CSA nominations including Best Comedic Series. 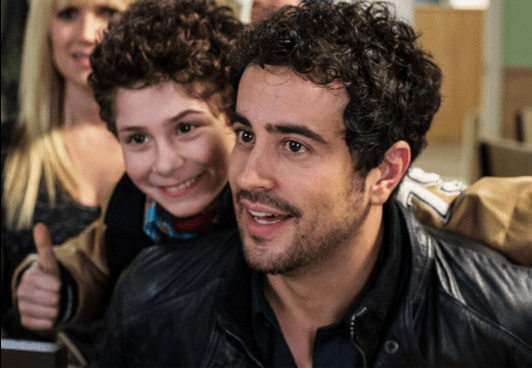 The first season of “SEED” was hailed as both a critical and commercial success and has been picked up by U.S. network The CW set to debut on the CW Monday July 14. William returned to his starring role of Billy Jones-Krasnoff in the second season of “SEED” and is just wrapping up airing Thursday nights at 9pm on CityTV. The series stars Adam Korson (2 Broke Girls) as Harry, a bachelor-bartender and sperm donor. Harry discovers that his foray into the world of sperm donation has resulted in kids – lots of kids! This ill-equipped bachelor finds himself entangled in the lives of his newfound children and their less-than-thrilled families with whom he’ll come to share more than just his DNA. William Ainscough has been busy with other several acting gigs; having played the iconic role of John Darling in ABC’s “Once Upon a Time”, completing a major supporting role in “The Christmas Ornament” for Hallmark Channel coming out this December, and a leading role on “The Haunting Hour”, which will air on the HUB Network later this year. 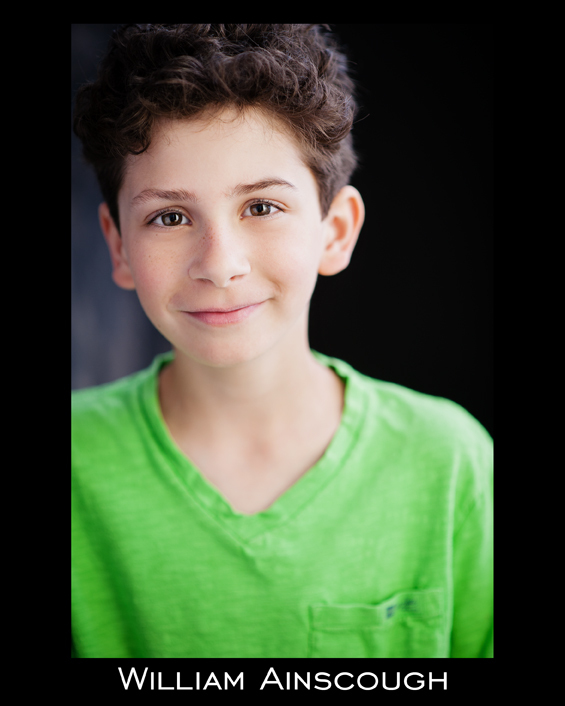 Continuously pursuing his acting ambitions, William also booked a role in the comedic Disney Channel Original Movie “Zapped”, set to debut June 27, 2014. He has been working with multi-talented recording artist/actress Zendaya (“Dancing with the Stars,” “Shake It Up”), who will be headlining “Zapped,” the story of Zoey, a girl whose well-ordered life is up-ended when her mother remarries and she finds herself part of a family composed of rambunctious, chaotic – and most of all – messy boys and a male dog, to boot. 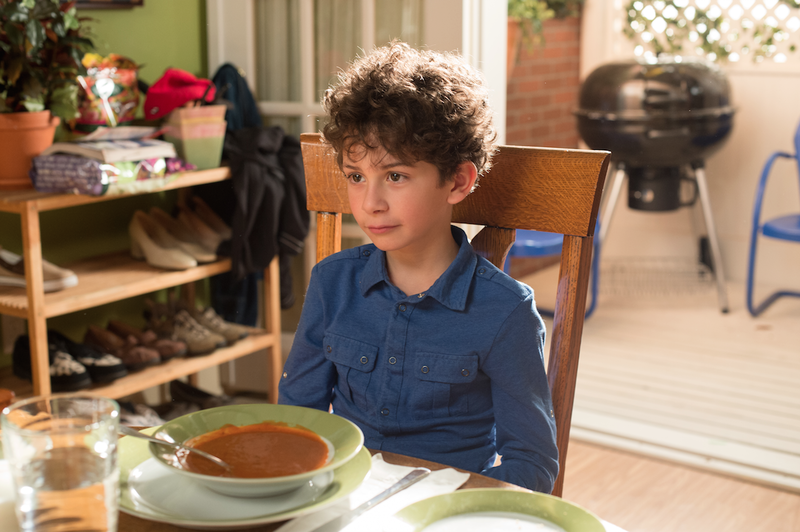 William plays Ben, the youngest and messiest of Zendaya’s step-brothers. After booking his first two auditions, it was clear that acting was a path well chosen for William. He has been thrilled to be able to add actor and his new bookings to his resume of accomplishments. Following in his parent’s footsteps (Nicole Oliver, actress; Chris Ainscough, composer/film editor), William Ainscough is making a serious impression in the entertainment industry. William has had the chance to act opposite his mother in several episodes of SEED , when she plays Billy’s teacher/Vice Principal, Mrs. Anderson. It was after watching his mother in action during visits to the sets of some of her film projects that William’s interest in the acting world began. Nicole inspired him to try acting for himself and his very first attempt at acting was a success, when he landed his first audition in May 2012—an open casting call for a new feature film “Hidden”. The feature film, which follows a family hiding in a bomb shelter after a mysterious outbreak devastates civilization, stars Alexander Skarsgard (True Blood, Battleship) and Andrea Riseborough (Oblivion, Never Let Me Go). William was successful in landing the role of Joey, a slightly shy and soulful boy and close friend and neighbor of Zoe’s (Emily Alyn Lind). The film Hidden, directed by The Duffer Brothers, and is set to hit theatres in 2014. This entry was posted in William Ainscough and tagged 2 Broke Girls, 2014, ABC, accomplishments, acting, actor, actress, Adam Korson, Alexander Skarsgard, Andrea Riseborough, auditions, baseball, Battleship, blog, blogger, Canada, CBS, Chris Ainscough, City TV, comedy, commercial, composer, Disney Channel, drummer, editor, entertainment, film, filming, Halifax, Lesley Diana, Minecraft, network, Never Let Me Go, Nicole Oliver, Nova Scotia, Oblivion, Once Upon A Time, online, PR, press, Public Relations, publicist, resume, Seed, series, soccer, The CW, The Duffer Brothers, The Promotion People, theatres, True Blood, TV, U.S., United States, Vancouver, William Aisncough on June 15, 2014 by press. 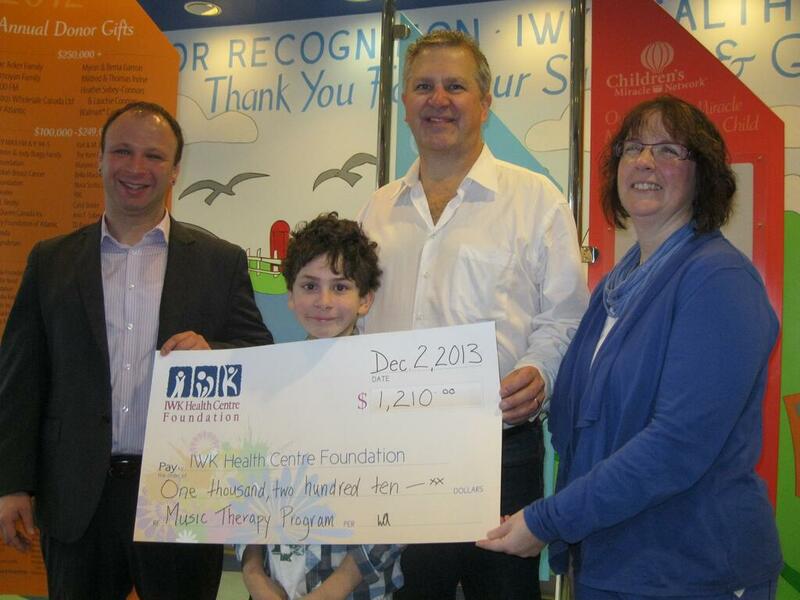 Young actor William Aisncough raised money while taping CITY TV’s “SEED” to contribute to the Music Therapy Program at the IWK Health Centre Foundation in Halifax. Just wrapping up filming the second season of “SEED” in Halifax, Nova Scotia, William found inspiration by the beauty of the province and the kindness and generosity of the people. His hope was to give the gift of music to brighten the day and make it a little easier for the children who are going through treatments at IWK. Continuing in the spirit of giving, the production company Force Four Entertainment generously matched what William raised and presented them with a cheque for $1210. Alongside William, CITY TV’s hit series “SEED” stars Adam Korson (from the CBS hit comedy 2 Broke Girls). Adam Korson plays a bachelor-bartender and sperm donor who becomes an overnight father to three different children. Adam begins his relationship with the families of his children: an upper-class family with a rebellious teenage daughter, a neurotically hopeful single mother-to-be, and a laid-back lesbian couple with a 9-year-old son Billy who is played by William. William Aisncough was also recently nominated for his first UBCP/ACTRA Award in the ‘BEST NEWCOMER’ category for his starring role in “SEED”. The awards were handed out in Vancouver on November 24th. The first season of “Seed” was hailed as both a critical and commercial success and was picked up by U.S. network The CW. This entry was posted in William Ainscough and tagged 2 Broke Girls, 2014, ABC, accomplishments, acting, actor, actress, Adam Korson, Alexander Skarsgard, Andrea Riseborough, auditions, baseball, Battleship, blog, blogger, Canada, CBS, Chris Ainscough, City TV, comedy, commercial, composer, Disney Channel, drummer, editor, entertainment, film, filming, Halifax, Lesley Diana, Minecraft, network, Never Let Me Go, Nicole Oliver, Nova Scotia, Oblivion, Once Upon A Time, online, PR, press, Public Relations, publicist, resume, Seed, series, soccer, The CW, The Duffer Brothers, The Promotion People, theatres, True Blood, TV, U.S., United States, Vancouver, William Aisncough on December 5, 2013 by press. 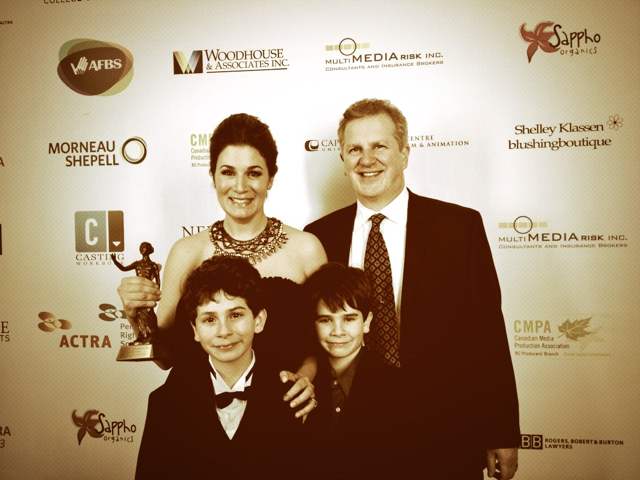 Congratulations to Nicole Oliver who was awarded the UBCP/ACTRA Award for Best Voice! Nicole Oliver was honoured as one of the top talents in BC at the second annual UBCP/ACTRA Awards at the Vancouver Playhouse on November 24th. The Awards Gala was attended by hundreds of industry professionals, members, partners, press, and politicians. For more information on the event, visit www.ubcp.com. Nicole has been busy with numerous roles, most recently playing a stage mother in the independent feature film “Leap 4 Your Life”, which premiered at VIFF in September and October 2013. Nicole has also just completed a supporting role in the soon to be released Hallmark film, “The Christmas Ornament” starring Cameron Mathison and Kellie Martin. She has guest starred on numerous television series; recent roles include “Supernatural and “Rogue”. She has also starred in many MOW’s including recent releases “The Woodcarver” with John Ratzenberger; “Taken Back – Finding Haley” with Amanda Tapping and “Innocent” with Bill Pullman and Marcia Gay Harden. For 4 seasons, Nicole was also the host on the hit Slice Network series “Crash Test Mommy”. Following in Nicole’s footsteps, her son William Aisncough was nominated for the ‘BEST NEWCOMER’ category for the UBCP/ACTRA Awards for his starring role as ‘Billy’ in City TV’s second season of “SEED”. Nicole joins her young son in the hit series “SEED” and will once again be playing Billy’s teacher, Mrs. Anderson, in several episodes this season, as well as perfecting her chops as the Ultimate Stage Parent to William behind the scenes. The first season of “Seed” was hailed as both a critical and commercial success and has been picked up by U.S. network The CW. This entry was posted in Nicole Oliver, William Ainscough and tagged 2 Broke Girls, 2014, ABC, accomplishments, acting, actor, actress, Adam Korson, Alexander Skarsgard, Andrea Riseborough, auditions, baseball, Battleship, blog, blogger, Canada, CBS, Chris Ainscough, City TV, comedy, commercial, composer, Disney Channel, drummer, editor, entertainment, film, filming, Halifax, Lesley Diana, Minecraft, network, Never Let Me Go, Nicole Oliver, Nova Scotia, Oblivion, Once Upon A Time, online, PR, press, Public Relations, publicist, resume, Seed, series, soccer, The CW, The Duffer Brothers, The Promotion People, theatres, True Blood, TV, U.S., United States, Vancouver, William Aisncough on November 25, 2013 by press. City TV’s “Seed” has been picked up by U.S. network The CW. William Aisncough has been nominated for the ‘BEST NEWCOMER’ category for the UBCP/ACTRA Awards for his starring role in CITY TV’s hit series “SEED”. The awards will be handed out in Vancouver on November 24th. The first season of “Seed” was hailed as both a critical and commercial success and has been picked up by U.S. network The CW. 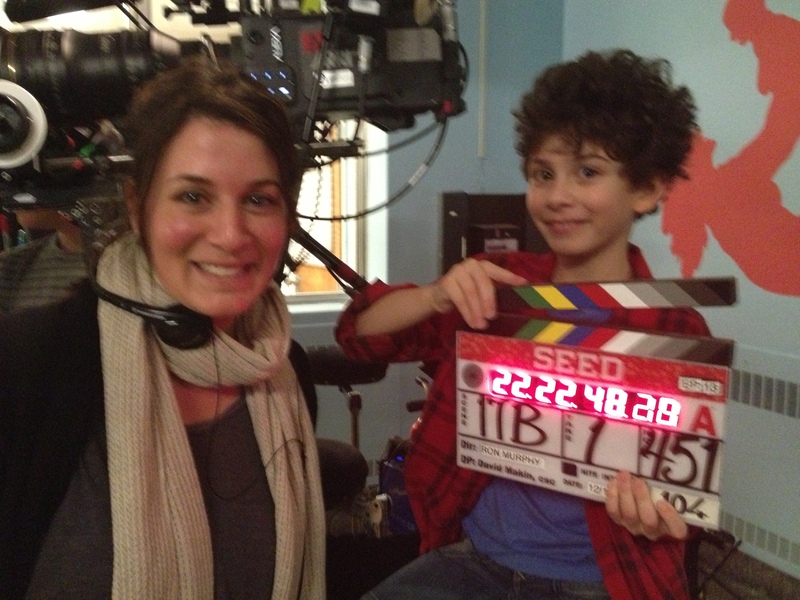 William is currently filming the second season of “SEED” in Halifax, Nova Scotia. The series stars Adam Korson (from the CBS hit comedy 2 Broke Girls). Adam Korson plays a bachelor-bartender and sperm donor who becomes an overnight father to three different children. Adam begins his relationship with the families of his children: an upper-class family with a rebellious teenage daughter, a neurotically hopeful single mother-to-be, and a laid-back lesbian couple with a 9-year-old son Billy who is played by William. Following in his parent’s footsteps (Nicole Oliver, actress; Chris Ainscough, composer/film editor), William Ainscough is making a serious impression in the entertainment industry. William has had the chance to act opposite his mother, Nicole Oliver, in several episodes of the series, when she plays Billy’s teacher, Mrs. Anderson. It was after watching his mother in action during visits to the sets of some of his Mom’s past film projects that William’s interest in the acting world began. Nicole inspired him to try acting for himself and began taking classes. William’s very first attempt at acting was a success, when he landed his first audition in May 2012—an open casting call for a new feature film “Hidden”. The feature film, which follows a family hiding in a bomb shelter after a mysterious outbreak devastates civilization, stars Alexander Skarsgard (True Blood, Battleship) and Andrea Riseborough (Oblivion, Never Let Me Go). William was successful in landing the role of Joey, a slightly shy and soulful boy and close friend and neighbor of Zoe’s (Emily Alyn Lind). The film Hidden, directed by The Duffer Brothers, and is set to hit theatres late 2013, early 2014. It was clear after booking his first two auditions that it was a path well chosen. William is thrilled to be able to add ACTOR, to his resume of accomplishments. 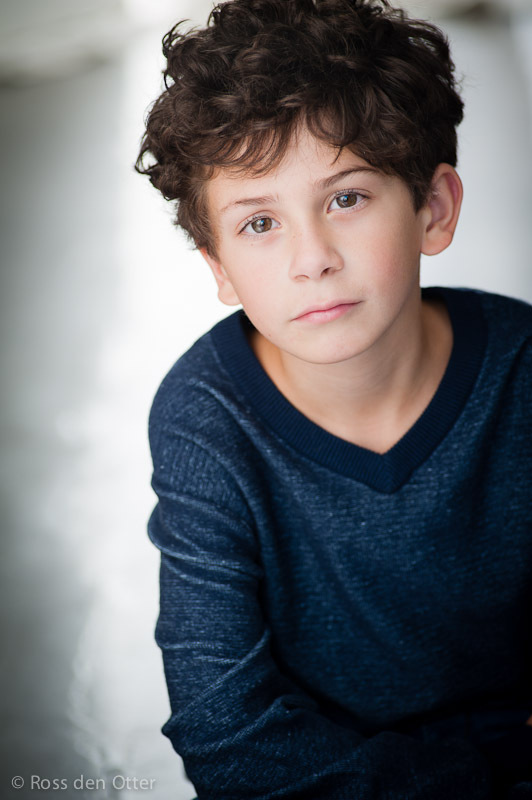 Other highlights for William this past year include playing the iconic role of John Darling in ABC’s Once Upon a Time, and a major supporting role in a “top-secret” television feature for the Disney Channel. This entry was posted in Nicole Oliver, William Ainscough and tagged 2 Broke Girls, 2014, ABC, accomplishments, acting, actor, actress, Adam Korson, Alexander Skarsgard, Andrea Riseborough, auditions, baseball, Battleship, blog, blogger, Canada, CBS, Chris Ainscough, City TV, comedy, commercial, composer, Disney Channel, drummer, editor, entertainment, film, filming, Halifax, Lesley Diana, Minecraft, network, Never Let Me Go, Nicole Oliver, Nova Scotia, Oblivion, Once Upon A Time, online, PR, press, Public Relations, publicist, resume, Seed, series, soccer, The CW, The Duffer Brothers, The Promotion People, theatres, True Blood, TV, U.S., United States, Vancouver, William Aisncough on October 1, 2013 by press.